Designed specifically for allergy and asthma sufferers, the engineers at Austin Air have created HEGA filtration - High Efficiency Gas Adsorption. 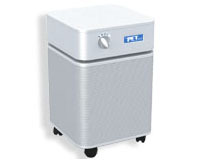 The Allergy Machine's 4-stage adsorption system combines the superior particle filtration of Medical Grade HEPA with the added adsorption capacity of the Activated Military Carbon Cloth. 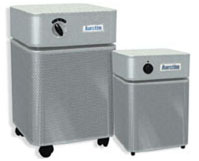 A smaller unit designed specifically for allergy and asthma sufferers. The Allergy Machine's 4-stage adsorption system combines the superior particle filtration of Medical Grade HEPA with the added adsorption capacity of the Activated Military Carbon Cloth. Allow your baby to experience the benefits of clean air and a better night's sleep. The Baby's Breath removes airborne contaminants and creates a comforting "white noise" clinically proven to help infants fall asleep faster and sleep longer. Designed for people with everyday air quality concerns. The HealthMate removes virtually all airborne particles by performing several critical air quality remediation functions. The HealthMate's 4-stage filtration system contains True Medical Grade HEPA and Activated Carbon, eliminating airborne particles, chemicals, odors and gases. 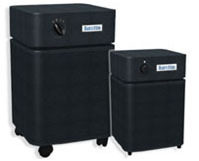 The HealthMate Jr. is a smaller unit that removes virtually all airborne particles by performing several critical air quality remediation functions. The HealthMate's 4-stage filtration system contains True Medical Grade HEPA and Activated Carbon, eliminating airborne particles, chemicals, odors, and gases. 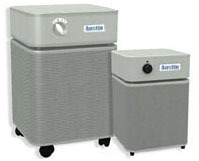 For the chemically sensitive who require the most comprehensive air cleaning solution available. The HealthMate+ combines superior particulate filtration with advanced gas filtering capabilities to remove more household chemicals, gases and odors. A smaller unit for the chemically sensitive who require the most comprehensive air cleaning solution available. The HealthMate+ combines superior particulate filtration with advanced gas filtering capabilities to remove more household chemicals, gases and odors.